Size: about 10-1/2" x 13-3/4"
The line in the picture is because of scanning, not folded. It is BRAND NEW!! 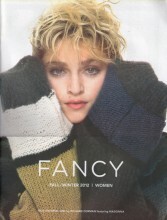 MADONNA Give It 2 Me USA Double 7"
Click the button below to add the MADONNA Fancy (Fall/Winter 2012) USA Magazine to your wish list.